This two-bedroom, two-and-one-half bath townhouse, which sleeps six, has plenty of space for a large family or two couples to share. With gorgeous unobstructed ocean views from the living room, dining room, master bedroom (where you can watch the dolphins play while laying in bed), large living room deck and master bedroom balcony. The living room deck has a high-top table and chairs where you can enjoy morning coffee, afternoon refreshments and stunning sunsets. Kitchen with lots and lots of storage space, modern appliances - microwave, flat-top stove (electric), self-cleaning convection oven (electric), dishwasher, extra-deep double sink with disposal, and a large, full-size refrigerator/freezer with ice maker. Among the furnishings in the large living room is a queen-size sleeper sofa, 50-inch color HDTV, Blu-ray DVD player, stereo-CD player, ceiling fan, adult and children books, children's DVD's, games and puzzles - just in case the weather keeps you inside. Also located on the main level is a whimsically decorated half bath. On the upper level is a guest bedroom, which is furnished with 2 full beds (pillow-top mattresses) and decorated in a nautical theme. This bedroom has a 27' Flat Screen TV with DVD player and a supplied HDMI cable to connect your game system. There's a full bath and large linen/storage closet stocked with 6 over-sized beach towels, located in the hall just outside the guest bedroom. The master bedroom is furnished with a king-size bed with a pillow-top mattress and has an adjoining private full bath. The master is equipped with a 27' Flat Screen TV with DVD player, clock radio/alarm and ceiling fan. 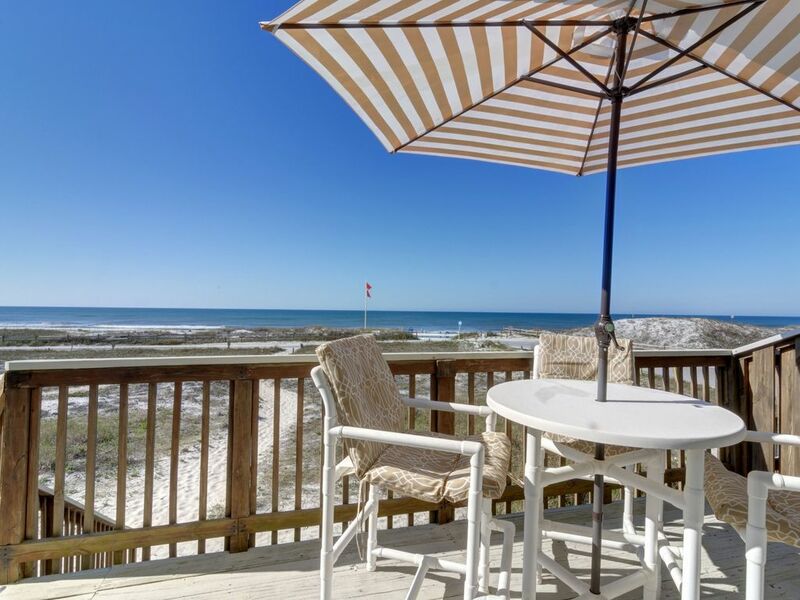 Enjoy a stunning, unobstructed beach/ocean view from the master balcony, which has two high-top chair for star gazing, or lounge in bed as you enjoy the view or listen to the gentle sound of the surf. Other amenities include free high speed wireless Internet, full-size high efficiency washer/dryer, covered parking for two vehicles. We also furnish beach chairs, beach towels, umbrellas, sand toys, beach bag and a large cooler. An outside shower is conveniently located just off the deck and there are outside barbecue grills (charcoal) to cook your catch as you watch breathtaking sunsets! WE DO NOT RENT TO VACATIONING COLLEGE STUDENTS, YOUNG ADULTS UNDER THE AGE OF 25 OR CHAPERONED GROUPS. Cable TVs (three), DVD players (three), Radios/Alarm Clocks (two), Electric Oven, Disposal, Coffee Maker, Ice Tea Maker, Crock Pot, Cooking Utensils - Pots, Pans, Baking Dishes, Storage Containers, Etc, provided, All Linens/Towels including 6 oversized beach towels provided, Full-size Washer and Dryer, Ceiling Fans in every room, Books, Games, Puzzles, Videos, Beach Chairs, Umbrellas, Large Cooler, Beach Bag, Sand Toys. Beautiful views and comfort galore! Gorgeous townhome, super clean and well stocked, gorgeous ocean views and steps from the beach - one of the best we have stayed in through VRBO. We would definitely stay here again. The pictures don’t do it justice. It’s a small 2 bedroom, 2 1/2 bath townhome in a convenient location. The place is so clean! The furniture is all like new and well decorated. The beds were comfortable, nice mattresses, with good bedding. Bathrooms have been updated. Really a nice place for a small family or couples looking to get away. Great beach house with excellent proximity to beach! It was so nice to be on the beach and also was a little less crowded of an area! House was in great condition! Would definitely stay again! We loved staying here. We had everything we needed in the townhouse. The ocean view was great and the beach access was super close. Our vacation here was wonderful! We had an awesome week. The condo was great and was just how the pictures showed. Thank you!!! We do not rent to vacationing college students, young adults under the age of 25 or chaperoned groups. This is a non smoking property. In addition to no smoking inside the unit, smoking is prohibited on the outside decks, balconies and parking area. Maximum occupancy is limited to 6, which includes adults, children, toddlers & infants. Occupancy limit, age and smoking restrictions are strictly enforced. Any violation of stated policy will result in immediate eviction with forfeiture of all prepaid funds.